It’s the debate of fall, as gardeners survey their gardens “post frost”. Should they cut all the perennials back to the ground and pull out the annuals? Or should they keep it all "as is" until spring? 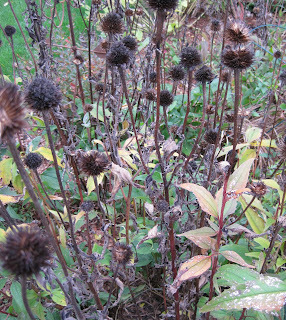 On the “keep” side of the equation, many of the perennial seed heads, and some annuals, too, provide food for the birds in the winter time. Who hasn’t delighted in seeing a bird precariously perched on a coneflower seed head, pecking away at the seeds? On the “cut” side of the equation, the birds aren’t going to eat all the seeds. Many will fall to the ground and sprout in the spring time, become plants out of place, weeds, that we must move or remove. On the “keep” side of the equation, all those perennials and grasses provide for winter interest in the garden, sticking up out of the snow or covered in ice. On the “cut” side of the equation, winter interest is in the eye of the beholder and for many, there’s isn’t all that much winter interest in dried up perennials and grasses. I choose a combo… Cut + Keep = Remove some of the most prolific self sowers, pull out the annuals, cut back anything that is diseased, leave a few seed heads for the birds. I generally keep until spring. The foliage and branches that remains helps shield the crown of the plant from those cold temps. They also can catch the leaves which provides more insulation. I cut and keep. It all depends on the mood that fall. I'm with Lisa...a little of both depending on my mood and ideas for spring.. I live by the motto -- leave the garden in the fall how you want to find it in the spring. But for me, I take a twisted view of that statement. In the spring I am so wildly anxious to be GARDENING that I want lots of stuff to DO in the garden. If everything is clean... well, I end up planting tomatoes a month too early and trying to protect them from every frost. So I keep, in a (most unsuccessful) attempt to keep myself too busy in the garden to do too much damage. I'm with you, cut some keep some. I like the look of some grass stalks and some seed heads poking up through the snow, but too much just looks like I was too lazy to tidy up before winter. Depends on the plant. Some plants with pithy stems will absorb water into the crowns if the stems are cut off, and fail to return. Some just cry out for cutting back, like Shastas. I selectively cut and keep. Perhaps leaving some of each. I remove annuals though. A bit of both - for those that succumb to a mush in the frsots, they are destined for the compost heap. Those that stand proud stay til spring. I got my post in for Garden Blogger's Bloom Day! I don't remember where to post it, OR I can't find it! So here it is.. I will repost? redirect? Re-remember? whenever? and now aboutthe actual post here..
Wolfdancer Creek keeps most everything that has a seed head. If it will grow next year, it's welcomed to. If it feeds birds, it's welcomed to that as well. If it is just kind of odd and interesting, it's to be allowed to continue to be odd and interesting until Spring, when I go in like a madwoman and CLEAN STUFF UP. Cut some, keep some. I tend to clean up more in the beds by the front door, and leave the back a little wilder. That seems to work. Gail's suggestion is a good one. Of course, I'm sure there will be no shortage of Coneflower seeds this year. I have been too sick to cut anything. Often the weather gets too cold too fast to get much cutting done, and some things, like phlox, still have some blooms, so I decide to wait. In January and February I always decide I should have cut back more in October. This year, I am late with cutting. I know what to expect in spring - a guessing game - who is who, since thousands of seeds are already in the soil. I mostly keep, but like you I cut annuals and diseased foliage, or anything that creates "interest" that is only negative (i.e., something that looks downright ugly when dried and brittle). About two weeks ago, I started leaving them and they will be part of my Autumn interest and of course all the pros you've mentioned. I do a bit of both. I sometimes get cutting and can't quite stop myself. I've hardly done anything yet so much is still blooming. Cut and keep is what I do. It just helps preserve, plan and know what i'd be sowing next. Funny...the Homes & Gardens section of The Oregonian had a feature on just this subject this morning, and reached the same conclusions: combo cleanup seems the way to go. I keep everything. Let the seeds fall where they may, let the shapes hold the snow in interesting ways, let there be places for the dog to stick her nose during the dead of winter. However, once all the leaves are down, I'll be doing some major work on the shrubs, so I'm not completely lazy in the fall! Carol, I tend to be a keep gardener and cut in the late winter, just before everything starts to sprout. I love the volunteers that come from the seed. Last yera was a cut, I think this year will primarily keep. Why you ask? just because I am so dang busy!